Reggae Rise Up Yoga Jam Write Up! 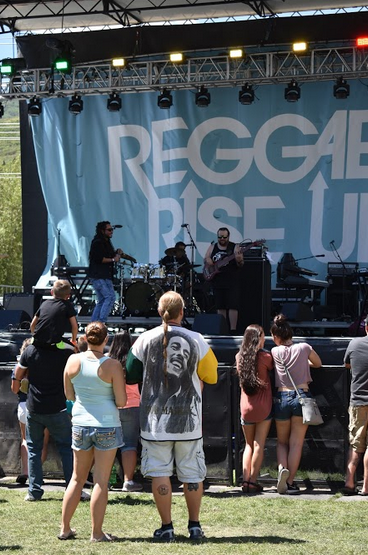 Mid August, just before the Great American Eclipse, reggae fans squeezed the final juices out of Utah’s summer at Reggae Rise Up Festival, at River’s Edge Resort in Heber. Slightly Stoopid, Stick Figure, Collie Buddz, Iration, Jungle Man Sam, and others drew in an all-ages crowd of about 4,000, to the festival’s first time as a camping festival. This was not Reggae Rise Up’s first rodeo. With neither the festival, nor the venue. The production team at Live Night Events also put on their second Bonanza Campoutearlier in June, and much of the volunteer base and team carried over into Reggae Rise Up (RRU). This was the seventh year of RRU, which had been at Liberty Park for the past few years. The move up to Heber was well-received, allowing people to spend the weekend and really escape with the whole family, with tent camping and cabin rentals on the property. Yet it was the first time Reggae Rise Up incorporated yoga into their program, as a grand finale to the 2 YogaJam sessions held in early August at the Downtown SLC Farmer’s Market. Both Saturday and Sunday mornings at the festival, campers could salute the sun in front of the “Local Love” stage to reggae music, with 2 classes offered by Salt Lake Power Yoga instructors, presented by We Are Yoga, a wellness brand. “There’s a lot of natural crossover between the reggae community and the yoga community,” says Adam St. Simons of Reggae Rise Up. And he was proven right, by the packed-full lawn of yogis at Sunday morning’s classes. Yoga veterans and first-time yogis alike down-dogged the night prior’s partying out of their system, while Jungle Man Sam both DJ’d and sang an acoustic set along to the flow of the class. The yoga felt like a true “come as you are” party; some yogis showed their advanced moves, while some giggled under the sunshine, mustering another Chataranga, or not. 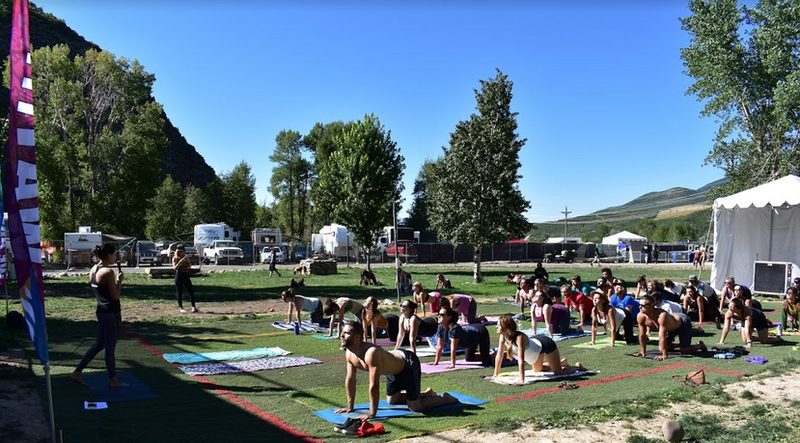 It was a mix between the Salt Lake Power Yoga’s athletic yoga style, the laid-back vibes of the RRU campers, and infused with the colorful, re-inventive style of We Are Yoga. We Are Yoga (WAY) is a Florida-based company, not to be confused with the local yoga studio in Salt Lake also called We Are Yoga. The brand makes yoga gear and accessories, the centerpiece being their WAY mats (We Are Yoga’s microfiber towel mat for hot yoga), which were available to test out at the YogaJam. WAY’s street art-inspired style approaches yoga with bright colors, eye-catching graphics such as the cartoon Ganesha, and the idea that yoga is something that everybody practices on a daily basis, whether you are aware of it or not. “Take a deep breath,” says WAY rep, JC “Sizzle,” who also MC’d the YogaJam, “You just did yoga!” This is how Sizzle and the WAY team navigate people who “just never really got into yoga,” pointing to the difference between the trending fitness phenomenon versus the ancient wisdom and simple benefits the tradition of yoga (pranayama– or breath work, included) can bring to daily life. Fresh after YogaJam, two full days of reggae followed. The surprise highlight of Saturday was not only Jungle Man Sam’s regular set, but also his reggae dancehall after-party DJ set from 11pm-1am. The late night dance floor was a hit. Late into Saturday night, after the official after-party, smaller after-parties continued. The camping area was filled with the music from various sound systems playing a mix of classic roots reggae from the likes of Bob Marley, Lee Scratch Perry, to the rock reggae of Sublime, Slightly Stoopid (who played Saturday), and the coming sounds of Citizen Cope, Collie Buddz and Stick Figure on Sunday’s linuep. Perhaps the most wonderful of all: the camp that played their favorite Sublime hits acoustic-style, as most of us drifted off to sleep, feeling among a like-minded, mellow, and family-friendly group of people. The shared love of reggae made for a easy-going populace, always surrounded by herbacious cloud of smoke, and a shared sense of nostalgia and history around the genre. Indeed, as if to reignite our more youthful selves, the music that brings us back to when we first listened to Bob Marley, or the early 90’s punky, raunchy ska hits of Sublime, both who are no longer with us (both Bob Marley and Sublime’s frontman, Bradley Nowell, died early deaths). Our love for reggae music not only unites the festival’s crowd, but also gives us continuous reminders in those beloved deceased artist’s music: Life is precious, you might as well enjoy it. And enjoyed it we did. Sunday, the Local Love stage got especially groovy for Salt Lake’s own, Funk & Gonzo, a five-piece reggae rock band that had the daytime audience dancing uncontrollably. The food vendor highlights included authentic Jamaican food, smoothies served in pineapples, a vegan food vendor, and Lola’s – a local food truck from Heber that makes you think twice that food trucks don’t serve gourmet food– i.e. a smoked salmon salad that was so good, it could be on the menu at a fine dining restaurant, but definitely for more than $12 (their price). Graffiti-style Reggae Rise Up murals were completed throughout the weekend. Vendors like Twisted Roots, a reggae store on Main St. in downtown Salt Lake, had pop-up booths, selling clothes, pipes and glass art. No one in the near proximity to the 5-year old girl who was excitedly showing her dad the elephant-shaped peace pipe could control their amusement, both by the innocent fascination at what she thought was just a cute glass elephant, as well as what a hoot it is to have both families and cannabis culture in the same place. On the Rise Up stage, Bermudan singer Collie Buddz played songs from his recently released album, “Good Life,” as well as some of his older hits, “Gimme Love,” “Tomorrow’s Another Day,” and “Come Around,” covered Bob Marley’s “One Love,” but also shared the stage with the strong female force, Serena. While reggae is relatively male-dominated, Serena brought some yin to the overly prevalent yang to the festival. Stick Figure and Citizen Cope finished out Sunday night, drawing the weekend’s biggest crowds. Another successful year in the books for RRU, which made a remarkable step forward in giving Utah’s reggae fan-base a place to vacation for the weekend. For those who want to travel, given that Reggae Rise Up will also be throwing their fourth Reggae Rise Up festival in St. Petersberg, FL each March, make that two.